Katie's Blog: Busy, busy, busy! That is my life right now! Between school activities and Kindy photo shoots, not to mention getting my tax sorted my life is hectic to say the least! I have been doing my required scrapping, which will be shared at the beginning of next month, but I have also been feeling the need to do some other scrapping! My circles are the sequins, the amazing die cut and there are some stencil circles in texture paste on the background. The rectangle is the large rectangle behind the photo using the triangle patterned paper. 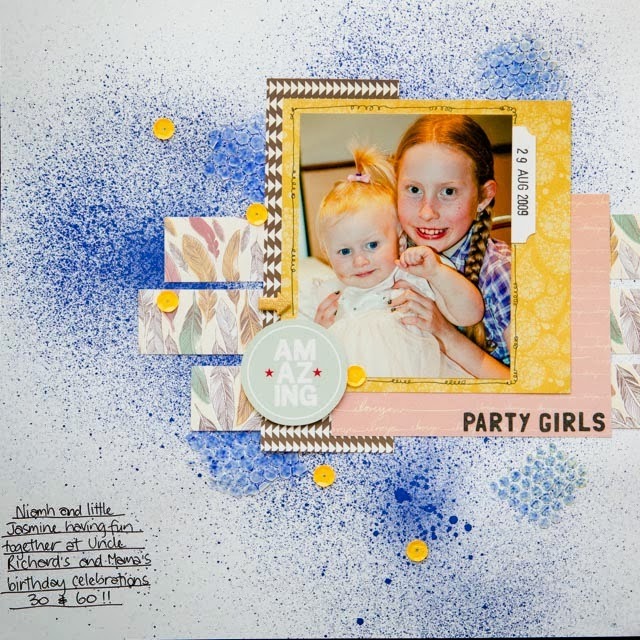 The strips are the patterned paper strips behind the photo, the hexagons are stenciled in texture paste on the background (and not very obvious!) and last of all the squiggle is the border drawn around the photo. Phew, it was harder than I thought to include everything! Just a quick page, and something to help me wind down during a busy time, and hopefully I may get time to do another before the month is out! Although finding time between weddings, kindy's and camping could be interesting! If you do have time, check out the WW1 challenge for October - White with Watermelon or the great Neon Pop inspiration board over at D'Lish Scraps! Lovely page! The misting looks great :) Thanks for joining us at STG! Thanks for joining us at STG! what cute little party girls!